Items made of agate, jasper and other semi-precious stones have been prized by collectors since at least Classical times. William Beckford and the 10th Duke of Hamilton both had highly developed interests in such work and Hamilton Palace contained some internationally important examples, including the so-called 'Rubens Vase' of agate (now in the Walters Art Gallery, Baltimore), and this piece. The jasper ewer itself is either Byzantine or medieval, and would probably have been preserved in a secular or religious treasury of some sort. It was evidently highly regarded in the mid-1730s because it was fitted with solid gold mounts by a leading Parisian goldsmith and given a new lease of life. The mounts on the top are based on a design by the great French painter Fran�ois Boucher and a related design appears in the artist's Livre de vases, published around 1738. The ewer is clearly recorded, beneath a glass shade, in the First State Dressing Room, in the inventory of Hamilton Palace compiled in the early 1850s. It was one of the items illustrated in the 1882 Hamilton Palace sale catalogues and sold to the dealer Samuel Wertheimer for �2,467.10s. From Baron Charles de Rothschild, in Frankfurt, it passed, via his daughter, to Baron Henri de Rothschild. 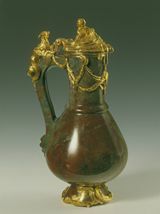 Financial difficulties during World War II obliged Baron Henri to sell the ewer to Calouste Gulbenkian in 1943 and it is now in the Calouste Gulbenkian Museum in Lisbon.